Okay friends, THIS is the post you need, just in time for the holidays (or any day that’s a pie day): How to make the PERFECT Pie Crust. It’s easy and fast and you CAN make it from scratch, homemade, and LOVE it. You just need a few ingredients and a simple method for making a flaky and flavorful pie crust good for any pie. 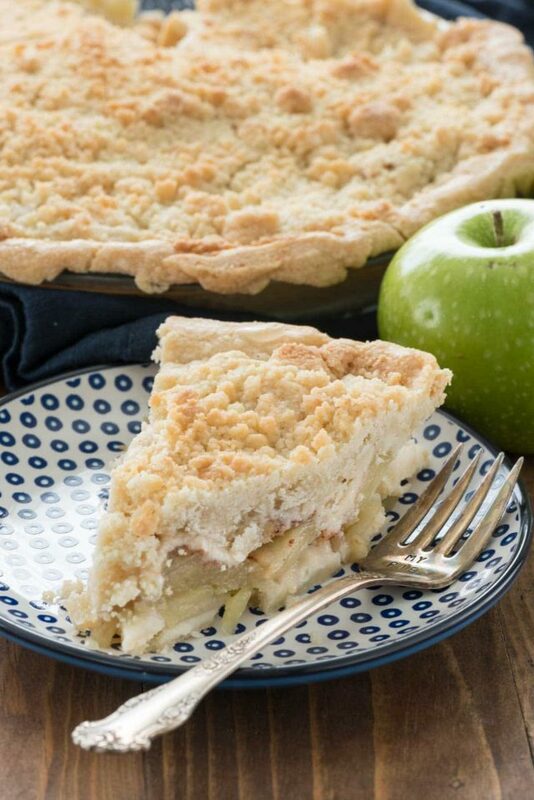 It’s easy to make a pie crust for a fruit pie or a pre-baked crust for a custard, top the pie with crumble or a lattice or put vodka in it or make it however you like it. 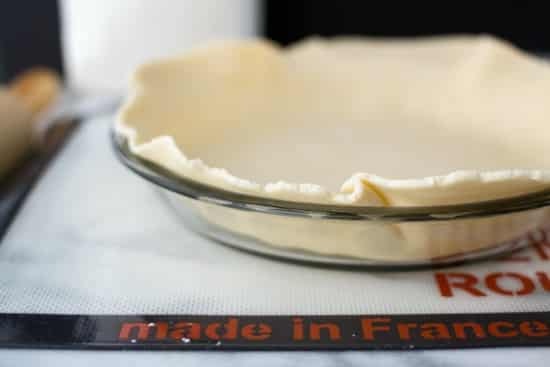 Whatever you do know that making a foolproof pastry pie crust is EASY and attainable, if you follow these rules. 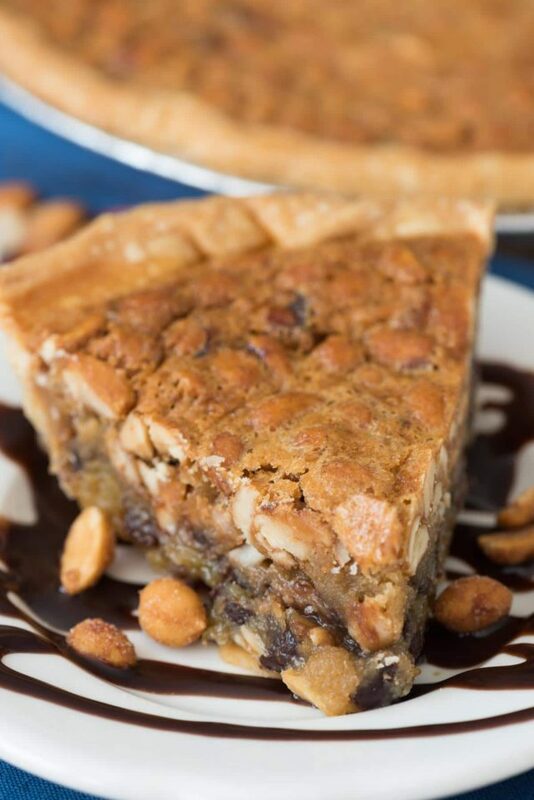 Once you’ve mastered the technique, be sure to check out my ULTIMATE list of Pie Recipes and the biggest list of NO BAKE PIES ever! Do you think that gorgeous pie crust looks hard? Think again. Just a little time and it’s EASY. There’s so much to talk about when you’re making a pie crust, so let’s get started. 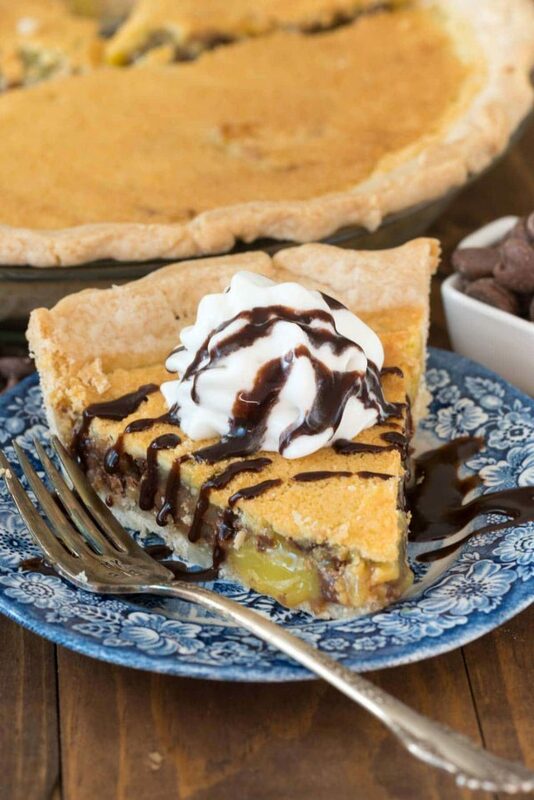 How to make the PERFECT Pie Crust – these tips make it easy and foolproof! My go-to pie crust recipe is my all butter pie crust. I’ve also made crust with half and half shortening and butter, as well as an apple cider pie that uses cider instead of water. My friend Lisa also has a killer vodka pie crust recipe. There is an age-old debate about what ingredients to put in pie crust. Do you use butter? Or shortening? Or maybe lard? I know that pie crust fat is a heated argument in many families (whenever I mention my all butter crust recipe my dad brings up my great-grandmother’s Crisco recipe). 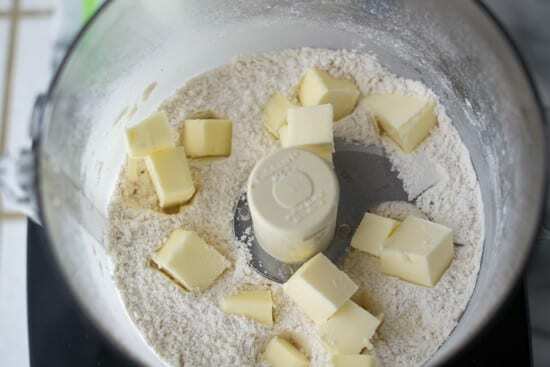 Fat is probably one of the most important parts of any pie crust; without it you’d just have a flour paste. The fat gives the pie crust it’s flavor and it’s tenderness and flakiness. The amount of fat, the kind, and how it is added to the flour will determine the overall flakiness and texture of the crust. A solid fat (i.e. butter or shortening) will give a flakier crust because they are solid at room temperature and hard when they are cold. All Butter Crust: the flavor of the butter will shine through in this crust. 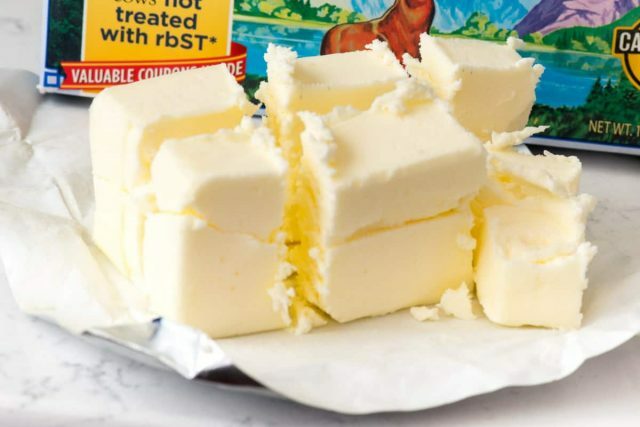 Butter can be difficult to work with because it melts faster than shortening, but the flavor can’t be beat. 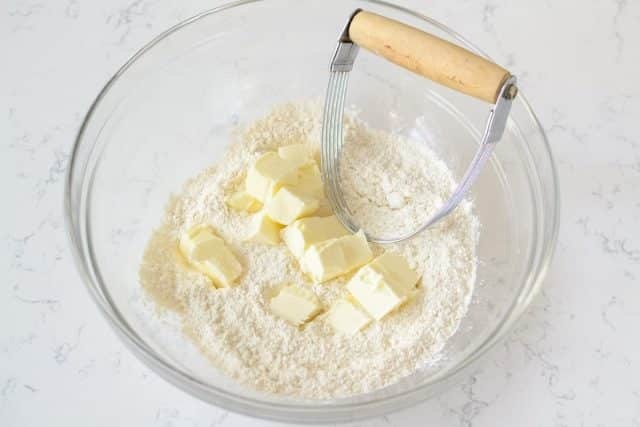 Never use low-fat butters or butter substitutes for a pie crust! All Vegetable Shortening Crust: vegetable shortening has a higher melting point than butter, making it easier to work with. Because of that, you’re less likely to overwork the crust which, technically, will yield a much flakier crust. The shortening crust typically has no flavor and is much more bland than a crust with butter. Combination Butter/Shortening: this method should be the best of both worlds, right? Some shortening gives you more chances you’ll get a flakier crust but you’ll have some of that rich butter flavor. Oil (vegetable, coconut, etc. ): the fact that oil turns to liquid at a much lower temperature makes it not an ideal candidate for a flaky pie crust. For the average home baker, the most typical flour to buy is All-Purpose (AP) Flour. AP flour is the kind I normally use in my baking. Flour is used in baking mainly because of the gluten that is created when it mixes with water. Some baked goods (like bread) need more gluten to achieve the consistency needed. For other baked goods, like pie crust, you want less gluten so that the end result is flaky, short, and crumbly. Flours that are higher in protein produce more gluten and vice versa. Pie crusts, therefore, want a lower protein flour. AP flour fits the bill, ranging between 10-12% protein, depending on the brand. It’s a good flour that’s good for all bakers of any level. If you’re adventurous, you can try pastry flour, which can result in a dough that is delicate and tricky to handle, but it’s the pro choice for pie crust. Salt is added to pie crust mainly for flavor. Even a butter crust can be bland without salt, assuming you’re using unsalted butter. You can play with the amount of salt added, but I usually add 1/4 -1/2 teaspoon per 1/2 cup of fat. 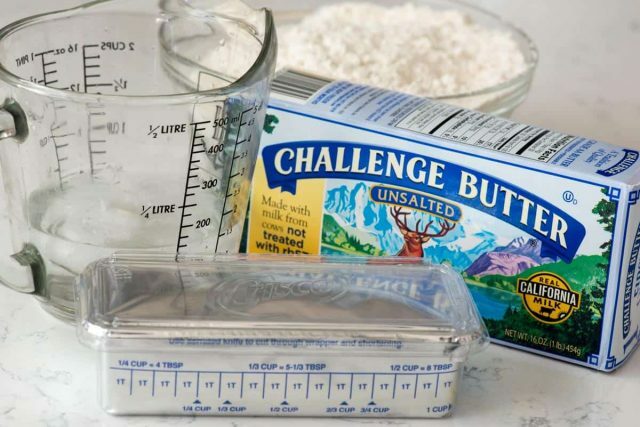 (If you’re using salted butter, reduce that salt by 1/4 teaspoon per 1 stick of butter, or omit it completely.) In general, you should use table salt when baking unless otherwise stated in the recipe. In order for the flour to do its job and create a structure that holds together, your pie crust needs water. Water is what binds together the bonded flour and fat and creates the final product. Be sure to always use ice water; using cold water will reduce the chances that your fat melts. You want the fat in as solid of a state as possible for the texture to remain flaky. Adding the perfect amount of water to your crust mixture is crucial, and is probably the hardest thing for newbie pie makers to gauge. Too little water and the crust won’t come together or will crack around the edges, too much water and it’s a mess. You need very little water to create the perfect pie crust (usually less than 2 tablespoons for a single-crust pie). It’s important to add it slowly and sparingly until you just have the right amount. When you start making a pie crust, you need to make sure your fat and your water are very cold. Dice up your shortening and/or butter into small bits before starting and put them back in the refrigerator. Put ice and water into a measuring cup so it keeps that water icy cold. Starting with very cold ingredients is the first step to pie crust success. If you’re making your crust the way grandma did, you’re doing it by hand. It also means you need to have a pastry cutter to make cutting the fat into the flour easier. (You can use two forks or knives, but that just takes even more time.) Once the mixture gets to a certain point, you’ll need to turn it out onto a lightly floured surface and work it into a disk, trying not to add too much flour. Crusts made by hand are said to be more delicate and flaky. Once you have a disk of pie crust dough, the next step is to turn it into a pie. 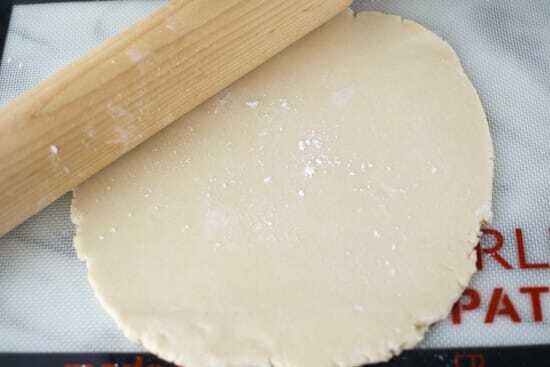 I like to roll out my pie crust immediately when it’s soft and easy to roll. 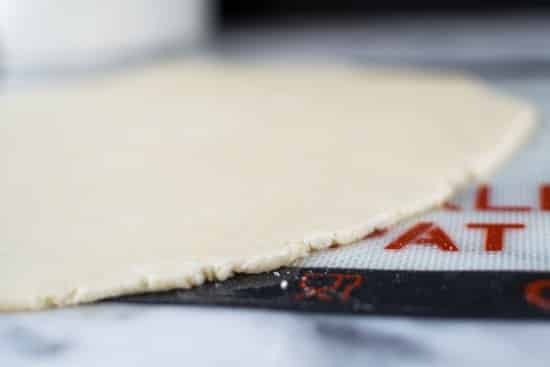 The best way to roll out a crust (or any dough) is by using a silicone mat made for rolling (like a Roul’Pat or Silpat). I’ll sandwich the dough between two sheets of wax paper and roll out my crust using a rolling pin. Then I place the crust into my pie plate and chill it for at least one hour (longer if possible). Chilling makes all the fat solid again so that when it bakes the cold fat, flour, and water can create the flaky texture. Warm dough will just melt in the oven because the bond between the fat and flour isn’t firm. Don’t skip the chilling step! Make sure the pie crust is chilled before you fill it. I like to keep it in the refrigerator for at least 30 minutes; using the freezer can speed up this process. Use a pie crust shield during baking. These can help reduce the browning of the crust edges while the pie cooks. You can buy silicone pie shields or make your own using strips of foil. Just remove the shield during the last 15 minutes or so of baking so the edges brown a bit. If you’re having trouble with the bottom of the pie crust cooking, try cooking the pie at a higher temperature to start. Cook it at about 400°F for 10 minutes, then lower the oven temperature to the temperature specified in the recipe. This helps cook through the bottom of the crust (I, personally, like the bottom less cooked, so I skip this step). Make sure the pie crust is VERY chilled before you pre-bake it. I like to keep it in the refrigerator for at least 1-2 hours; using the freezer can speed up this process. Poke several holes in the bottom and up the sides of the pie crust with the tines of a fork before baking. This helps reduce the bubbling that occurs during baking. Alternately, you can cover the bottom of the unbaked shell with parchment and line it with beans or pie weights before baking, but a fork is easier (and cheaper). 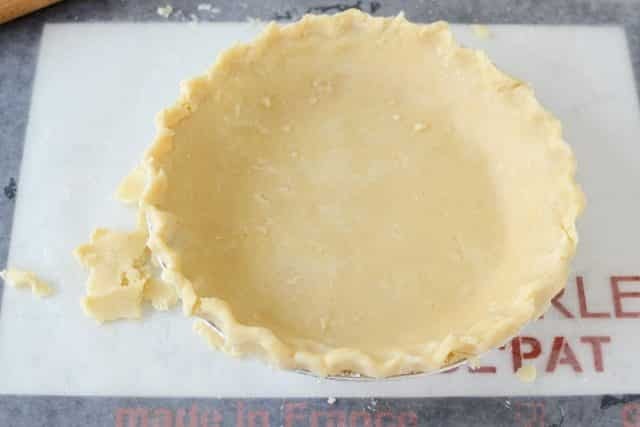 Pie crusts can be made ahead of time and frozen for faster use. Line your pie plate with your pie crust, then wrap well in plastic wrap. Freeze for up to 1 month. You can bake it from frozen or allow it to sit in the refrigerator before baking, but don’t let it sit at room temperature (it should still be very chilled before using, not soft at all). 9” pie plates: Unless otherwise noted, every pie recipe on this blog is made in a 9” pie plate. There are many different sizes of pie plate, so make sure you have some standard 9” (not deep dish) ones. Pastry Cutter: this is a great tool if you plan to make crust by hand or if you are making a crumble. Roul’Pat or other silicone surface for rolling: these help because your crust will stay put as you’re rolling it out. Food Processor if you’re batting for that team. Wax Paper to make it easier to roll out your crust without chilling first. Foil or Pie Crust Shield for protecting the edges of your crust during baking. Now get into the kitchen – YOU GOT THIS! This was so helpful and informative! You are THE pie crust guru! Dorothy this post is EPIC! What a fantastic resource! 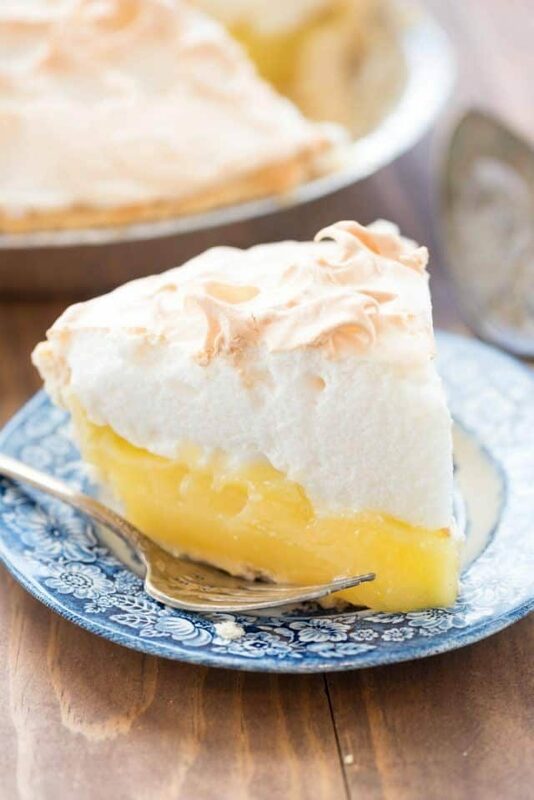 I can’t wait to try this with your Lemon Meringue pie. My mouth is watering already. Thanks for all the tips and tricks. great reminder about very cold ingredients, thank you, and thank you for all of these other crust recipes and pie recipes, vodka crust! Love it all, thank you! Thanks; will try the apple and pecan pies for Thanksgiving lunch! My foolproof version of pie crust is my Great Grandma Crowley’s “Water Whip” pie crust. It uses boiling water and yes, it comes out perfect every single time. 🙂 My dad, my cousins, and I all swear by her pie crust. Pour 1/4 cup boiling water over top of shortening salt, and milk. Whip with a fork until thick and uniform. Add 2 cups sifted flour. Rest before rolling out between 2 sheets of wax paper. What if I make a homemade no-bake cheesecake filling? Can I put it into a pre-baked pastry pie crust, and refrigerate? Would the butter dough work well for empanadas? I can’t wait to try your dough recipe for an Apple pie. Thanks so much for the step by step ! Very helpful. I learned so much from this! Thank you so much for sharing! Tried the butter/shortening crust. Not bad for my first try, came out a little dry. Made empanadas. Will try all butter crust next.